M-4 Small robot designed by Flint on his planet Holberg 917G (TOS: "Requiem for Metuselah"). M-5 Experimental computer equipped with Richard Daystrom's multitronic technology and installed on the Enterprise (TOS: "The Ultimate Computer"). See multitronics. Mag-lev carriage Means of transportation taking advantage of magnetic levitation. A mag-lev carriage is used by the Nezu on an orbital tether on one of their colony planets (VOY: "Rise"). Maglock Short for magnetic lock. Maglocks hold the deflector dish of a Sovereign-class starship in place ("Star Trek: First Contact"). 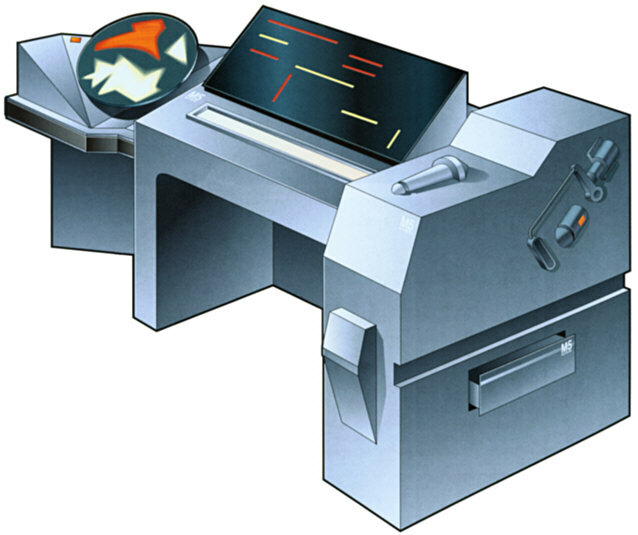 Magnaspanner Engineering device used in Starfleet (TNG: "Tapestry"). Cortin Zweller used such a device to manipulate the dom-jot table to the disadvantage of some Nausicaans. 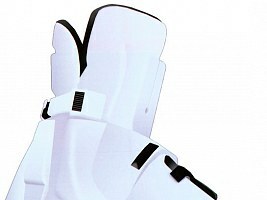 Magnetic boots Boots used in weightless conditions ("Star Trek VI: The Undiscovered Country", "Star Trek: First Contact"). 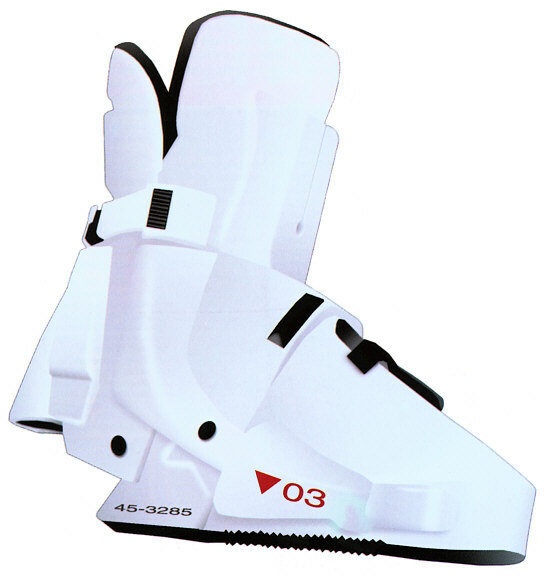 Although the Federation is in possession of nearly miraculous gravity and antigravity technology (which is basically the same), the 23rd as well as the 24th century gravity boots really seems to be based on magnetic adhesion. This, in addition to space sickness, may explain the cumbersome movements of Picard, Hawk and Worf in "First Contact". Magnetic constrictor Part of the warp core of a Federation starship. The magnetic constrictors allow a well-defined dose of antimatter particles to enter the warp core. Failure of the constrictors leads to the destruction of the starship (VOY: "Caretaker", VOY: "Dreadnought", ENT: "Cold Front"). Worf calls the maglocks "magnetic constrictors" at one point in "Star Trek: First Contact". Taking into account that the dish is charged with antiprotons, there may be constrictors similar to those in the warp core nonetheless. In DS9: "The Assignment" O'Brien states that he has installed new constrictors on the impulse engines. The impulse engines do not require antimatter to run, so the constrictors may constrict something else such as the deuterium or the plasma flow. Magneton scanner Versatile Starfleet engineering tool for thorough scans of space and subspace, but may also be used to degauss transporter platforms (VOY: "Time and Again", "Cathexis", "Learning Curve", "Coda"). In "Learning Curve" Tuvok told Chell to demagnetize the transporter using a microresonator, although he would have been much faster with a magneton scanner. 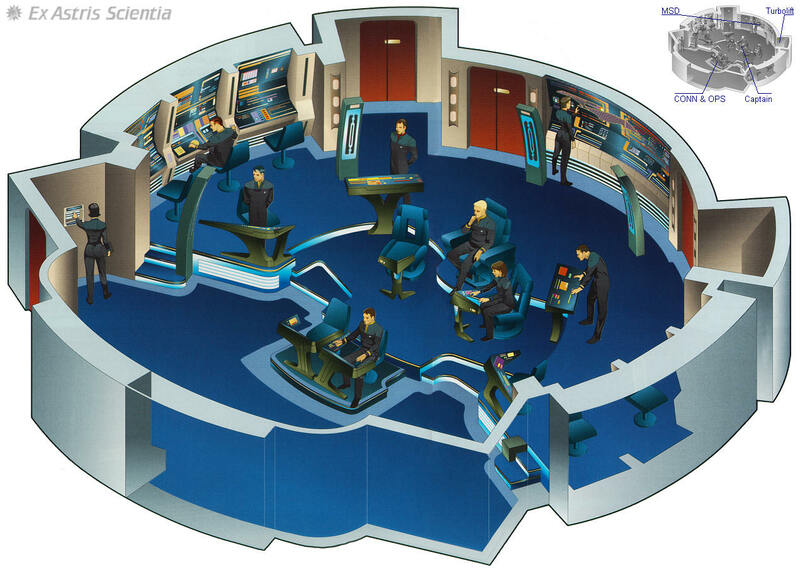 Main bridge Control center of a starship, usually located atop the saucer hull of Federation ships. The bridge includes workstations for command (captain and first officer), flight control (Conn, formerly separated into helm & navigation), mission operations (Ops), tactical, science, environment and engineering. Many stations can be quickly reconfigured for different tasks. Most alien ships possess command centers of similar size and configuration (generic). Most bridges on Starfleet vessels may be replaceable modules, so that adaptation to special missions or upgrading the ship is facilitated. The concept of bridge modules allows the use of different bridge sceneries for the same starship class and explains why the bridge of the Enterprise-A in "Star Trek: The Final Frontier" was completely different from the preliminary version in "Star Trek: The Voyage Home". The Miranda class was seen with as many as four different types of bridges. 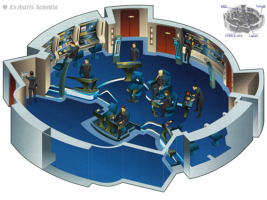 Main engineering Control center for propulsion, energy distribution, sensors, navigation, environmental and other ship systems, usually located next to the warp core (generic). Maintenance conduit Service corridor on Deep Space 9 (DS9: "Civil Defense"). See access tunnel. Manual release Manual door opener ("Star Trek: First Contact"). See also emergency hand actuator. Manual steering column Joystick-like helm control that can be deployed on Sovereign-class starships for more precise manual control of the engines ("Star Trek: Insurrection"). Picard would have wished to have such a gadget as Riker's joystick in TNG: "Booby Trap". Well, the soft-touch-button controls of the standard Galaxy-class console may provide a tactile feedback as if they were being depressed, still it looked a bit awkward. Masking circuitry Form of stealth used by the Kazon-Nistrim sect. A masked vessel is not perfectly cloaked but may be detected with a polaron burst (VOY: "State of Flux"). 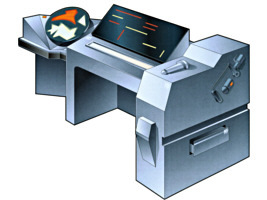 Master systems display Monitor that shows the status of a starship's systems in the form of an illustrated cross-section (generic). 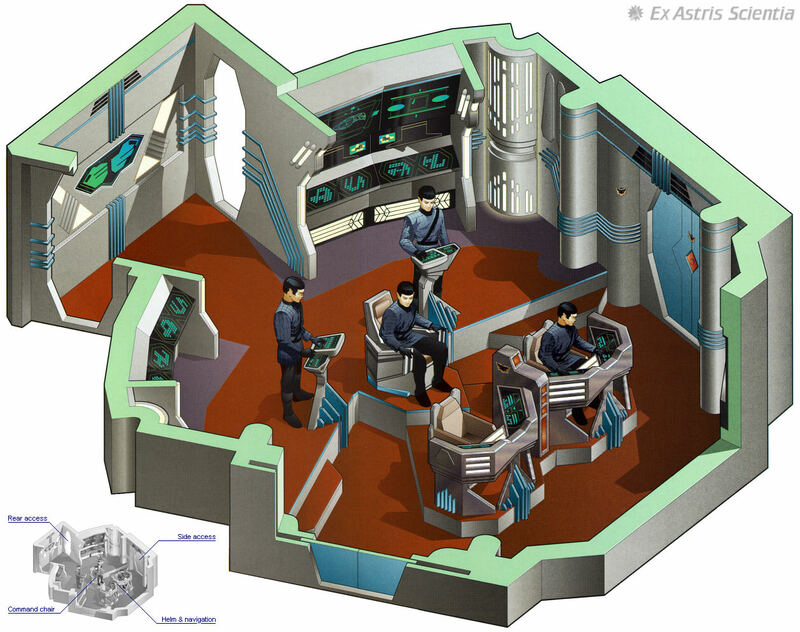 The Star Trek Encyclopedia distinguishes between the large master situation monitor that shows a cross-section of the ship, and the master systems display in the form of the famous "pool table" in the Enterprise-D engine room. 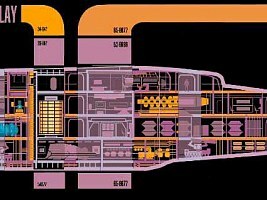 In fanon, however, master systems display (MSD) customarily refers to the cross-section of the ship. 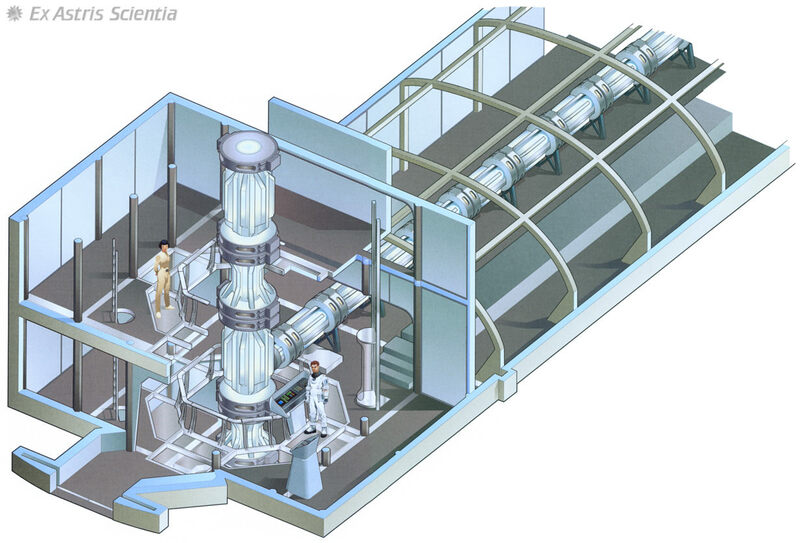 Matter/antimatter reaction chamber (M/ARA) See warp core. Matter stream In the concept of the transporter, the state in which individuals or objects are transferred to the remote site (generic). The matter stream is composed of the person's very atoms. It cannot be simply replicated, except in rare cases where transporter accidents duplicated an individual. Maturation chamber Container inside which Borg drones grow up, accelerating the natural development. 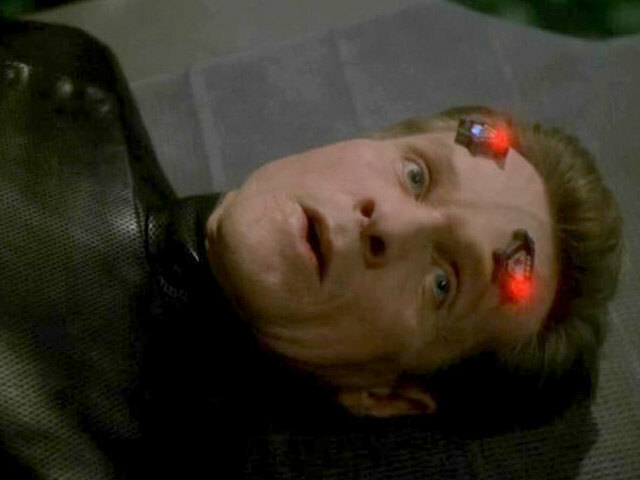 Borg who have been born as drones as well as assimilated children are placed in maturation chambers (TNG: "Q Who", VOY: "Mortal Coil", "Drone", "Collective"). 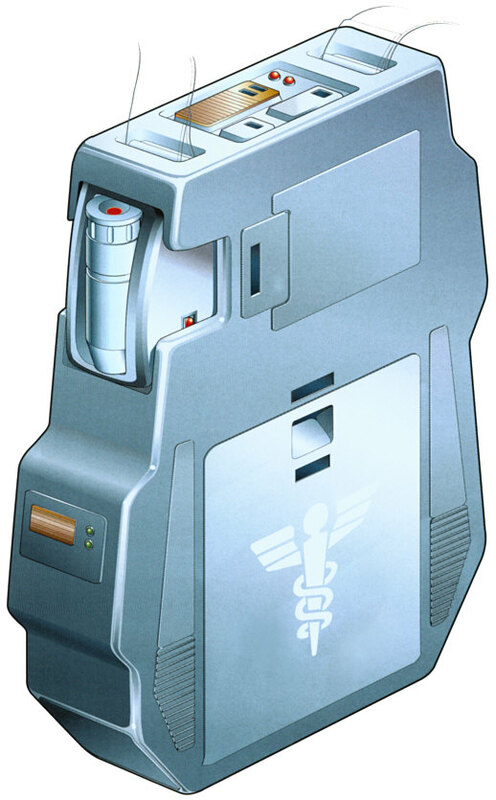 Medical tricorder Tricorder model which is equipped with an additional scanner for closer examination of patients (generic). Medkit Bag carrying medical instruments and supplies to be used on away missions (generic). Merculite rocket Talarian weapon. In the 24th century, these rockets pose no threat to a state-of-the-art Starfleet vessel but are powerful enough to destroy a starship (a Klingon cruiser in this case) whose shields are lowered (TNG: "Heart of Glory", "Suddenly Human"). Metagenic weapon Genetic mass destruction weapon prohibited in the Federation (TNG: "Chain of Command"). The Cardassians deceived the Federation in 2368 when they spread rumors about a metagenic weapon, and Jean-Luc Picard was captured while trying to find proof for it. 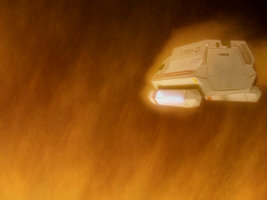 Metaphasic shield Deflector field capable of protecting a vessel from the intense radiation and high temperature inside the corona of a star (TNG: "Suspicions", "Descent"). The metaphasic shield was developed by the Ferengi scientist Dr. Regar in the first place (TNG: "Suspicions"). Dr. Beverly Crusher further promoted this technology and employed it to defeat the Borg in TNG: "Descent". Metreon cascade Weapon of mass destruction unleashed by the Haakonians that killed many of the inhabitants of the Talaxian moon Rinax, and left the survivors suffering from a deadly blood disease, metremia (VOY: "Jetrel"). 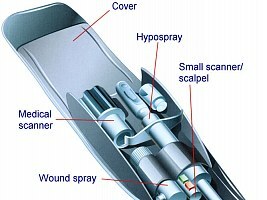 Microcaliper Engineering tool that can be used to grab or hold an object in place (VOY: "Retrospect", ENT: "Minefield", "Future Tense"). 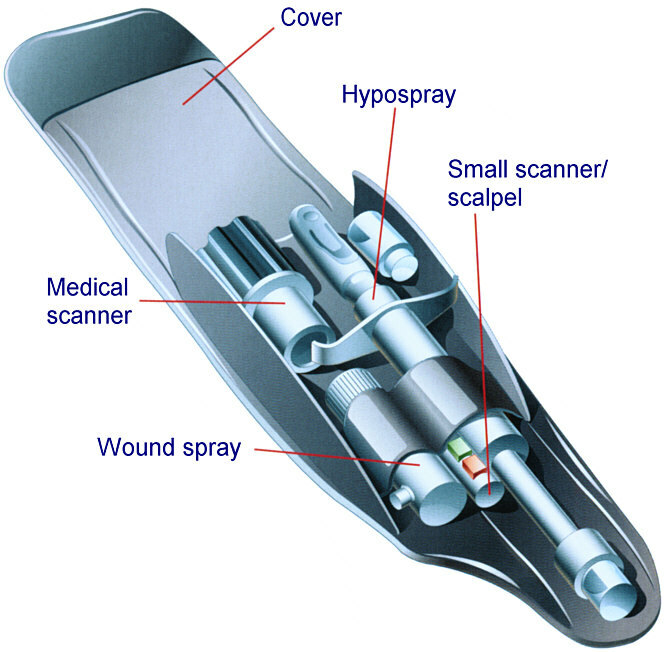 Although it sounds like a measurement instrument, the microcaliper is used rather like simple pliers. Microcellular scan Close examination of a patient's cells (generic). Microcircuit fiber Component of the Borg assimilation process (TNG: "The Best of Both World, Part II"). The concept of these fibers was replaced with that of the nanoprobes in later installments. 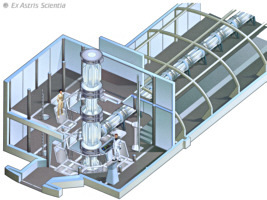 Microfusion generator Small power generation unit used by various civilizations for a variety of purposes, also called microfusion reactor or microfusion chamber. 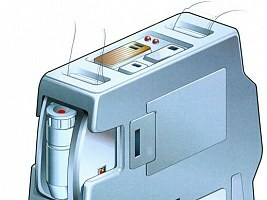 Such generators can be found on many types of shuttles and probes (TNG: "The Outcast", DS9: "Empok Nor", "The Changing Face of Evil", VOY: "Remember", "One"). 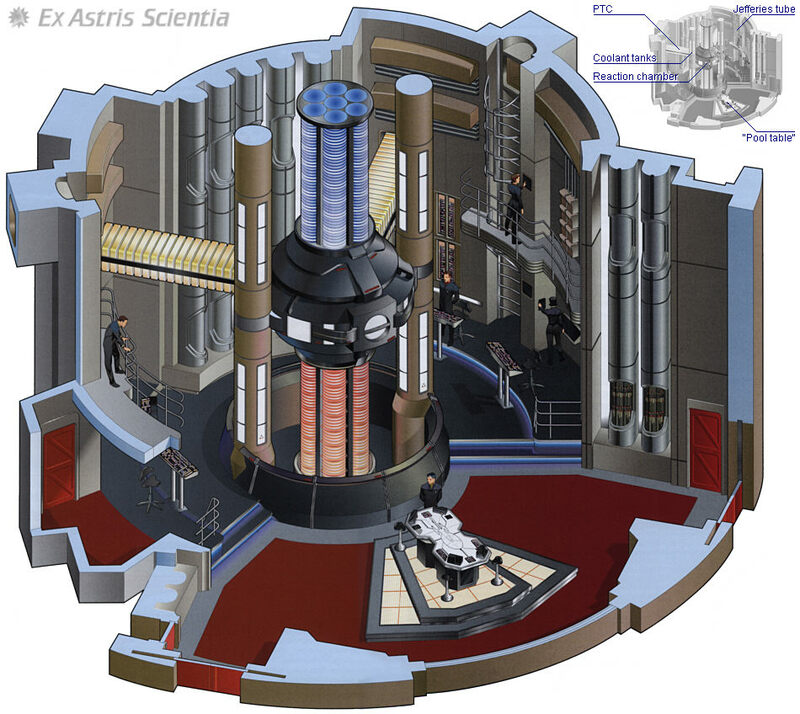 Microfusion initiator Device used to initiate fusion reactions on a small scale (DS9: "To the Death"). 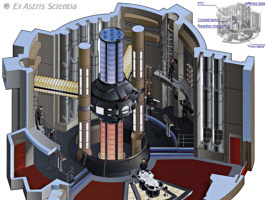 While the Jem'Hadar attempted to reactivate an Iconian portal with the device, it may usually be a part of a microfusion generator. Microprobe Small probe carried aboard Federation starships, measuring just a few centimeters in diameter (VOY: "The Cloud", "Eye of the Needle"). Microreplicator Miniaturized replicator, part of an exocomp. The microreplicator allows to create any tool that is needed. It also serves to form new circuitry (TNG: "The Quality of Life"). Microresonator Starfleet device that may be used to degauss small objects (VOY: "Learning Curve"). Mid-range phase adjuster Piece of technology constructed by Geordi La Forge and installed on the Enterprise-D. The adjuster serves to re-align plasma that was put out of phase (TNG: "Galaxy's Child"). 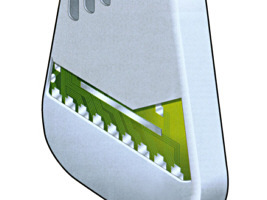 Mind probe Most often referred to as Romulan mind probe, sometimes as memory scanner. The mind probe is a device of Romulan origin that allows to scan a person's mind and record thoughts and memories, making it more efficient than any other interrogation technique (DS9: "Inter Arma Enim Silent Leges", "Extreme Measures"). Riker's mind was allegedly probed by the Romulans in TNG: "Future Imperfect" who, as it seemed, created a holodeck simulation based on Will's memories. But this Romulan ploy was only an illusion created by an alien boy named Barash. Mind-sifter Klingon interrogation device in the 23rd century. The mind-sifter may cause permanent brain damage at higher settings. Vulcan mental discipline may successfully defy the device (TOS: "Errand of Mercy"). Minshara-Class 22nd century Vulcan designation for Class-M planets (ENT). Mirror Universe See parallel universe. Mobile emitter Portable device enabling the EMH of the starship USS Voyager to work in environments without holoprojectors. This device originates in the 29th century and is not available on other Starfleet ships (VOY). Modesty subroutine Part of Data's program that instructed the android always to wear clothes (TNG: "Inheritance"). Molecular cybernetics Field of study that involves the creation of artificial intelligence using positronic neural networks. Molecular cybernetics was pioneered by Ira Graves and Noonien Soong (TNG: "The Schizoid Man"). Molecular decay detonator Explosive weapon of Romulan origin (TNG: "Reunion"). Duras used such a device during the Sonchi ceremony following Chancellor K'mpec's death. The Romulan origin of the detonator exposed his Romulan liaison. Molecular imaging scanner Part of a transporter system, captures the transport subject on a molecular level. There are four independent scanners per transporter pad (TNG: Realm of Fear"). The molecular nature of the scanner seems to be in contradiction to the Heisenberg compensator that is allegedly needed to tune the resolution as far down as to the quantum level. Molecular phase inverter See interphase generator. Mooring clamp See docking clamp. Motor assist band Medical device. They are small, rectangular devices attached to a strap, designed to be wrapped around a humanoid limb. The bands induce electrical impulses into damaged tissue, or route weak nervous signals around nonfunctional tissue (TNG: "Transfigurations", "Ethics"). Multidimensional transporter Transporter developed in the Mirror Universe to allow a transfer to our universe (DS9: "Through the Looking Glass", "Resurrection"). Multikinetic neutronic mine Borg weapon with a yield of five million isotons (VOY: "Scorpion, Part II"). Multispatial probe Advanced sensor probe carried aboard USS Voyager. 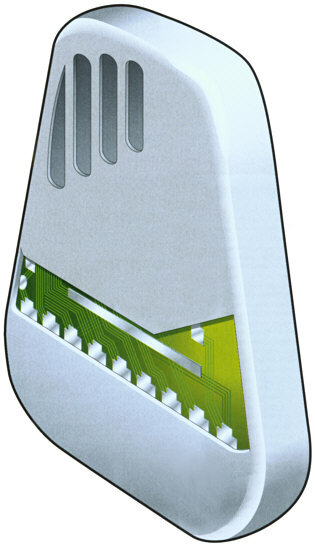 Designed with unimatrix shields to withstand high pressure and high temperatures (VOY: "Extreme Risk"). It was never explained what this probe is useful for and why it is so precious that it has to be salvaged even under extremely dangerous circumstances, except that the probe had Borg shields. Multitronics Further development of duotronics by Dr. Richard Daystrom, now including structures that make computer systems self-aware. The multitronic technology, however, wound up in a catastrophic failure when the self-preservation instinct of the multitronic device installed on the USS Enterprise attacked and crippled four other starships, killing hundreds of crewmen (TOS: "The Ultimate Computer"). Multivector assault mode Tactical maneuver with ships that are capable of separating into independent spacecraft with their own weapons and propulsion. The prototype USS Prometheus is capable of splitting up into three parts, each of them warp-capable (VOY: "Message in a Bottle"). Mycelial network Network that runs through the whole universe, and even parallel universes. This network can be used to travel from one point to another nearly instantaneously (DIS). See spore drive. The idea of an "intergalactic ecosystem" made of fungus spores is nonsense, considering that any heavy elements and any form of life could not exist until a few billion years after the Big Bang, when galaxies already existed and were millions of light-years apart.